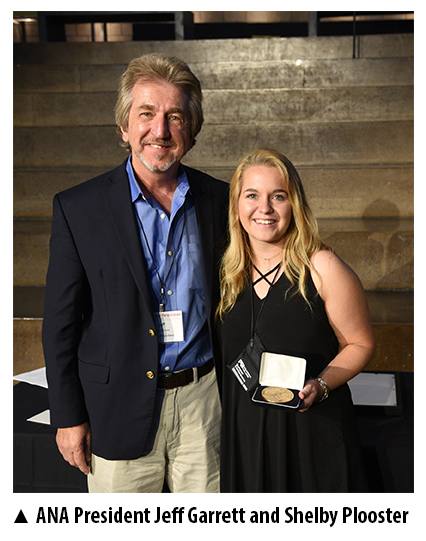 Shelby Plooster of Evans, Ga., was named the American Numismatic Association’s (ANA) 2017 Young Numismatist of the Year at the ANA’s Summer Seminar during the awards banquet on June 22. The award annually acknowledges an outstanding young collector for contributions to the hobby and industry. The 17-year-old began collecting in 5th grade, when she discovered some Early American coins in an antique shop, and has been establishing herself in the hobby ever since. A member of the ANA, Augusta Coin Club (ACC), South Carolina Numismatic Association (SCNA) and Women in Numismatics, Plooster has given numerous presentations at local and regional clubs on topics ranging from the 1923 Silver Certificate star note to Centennial Coins of the 1996 Atlanta Olympics. Her articles have been published in the ACC’s newsletter and SCanner, the SCNA’s official publication, and her exhibits have twice won first prize at the latter’s regional show. She also was named SCNA’s YN of the Year in 2014.